When production and service cycles take forever, and costs are high, chances are that most of your processes are mired in complexity. Since Victorian times, companies have felt compelled to offer consumers whatever they want, creating a myriad of choice with goods and services each having their own process and production lines. And it probably is to the detriment of the very people you are trying to please - the customer. Consider a few of the not so hidden costs of complexity:1. Customer inconvenience – Your customers have to negotiate your complex system and its mind-numbing array of alternatives. Q. Just how many Moments of Truth are there? 2. Unwieldy sales processes – The sales systems needed to support complex product lines soon grow too cumbersome, whether they require filling out complicated order forms, getting indecipherable invoices or navigating endless voice mail paths. Q. How many rules exist to ‘guide and direct’ and are not out of date slowing things to crawl? Q. How many handoffs occur in your processes between people, systems and services? Eradicating those Moments of Truth, Rules and Breakpoints can change everything.3. Impact on management – Eventually, even your managers will find numerous products and processes too much to track. Q. How much money have you spent training people to deal with this complexity? Remove the complexity and legacy approaches geared to streamlining processes may not be required! 4. As an absolute, the greater an organization’s complexity, the less focused its management. Q. Where does all that management time get directed? Fire fighting and fixing problems caused by the nightmare of complexity. Refocus management time to helping align processes for successful outcomes.You do not have to live with complexity. We have a phrase “Fix the Cause, Remove the Effect” – perhaps that can be your guide also? Outside-In BPM – utilize ground breaking techniques created by the market leaders who have redefined their markets and continue to outplay the competition in every aspect of the game. Labels: J P Zachman, Steve Towers, Sunil Dutt Jha, Zachman International Inc.
It’s a confusing world out there. At the last count there were over 6,000 improvement methodologies (Wikipedia) all geared to helping organizations get better at business. So at least there’s always been plenty of choice depending on your particular flavor of the month however one has to ask the question why so many and why do even the better ones fail to help our companies adapt and change? Regular readers of BP Group stuff will know we can be quite outspoken on this matter, and it’s best summed up by the phrase “you may be doing things right, but are you doing the right thing?”. The vast majority of techniques, approaches and methods are geared to fixing problems, and essentially getting better at doing things right. That was fine in the 20th century world where efficiency was king. Not so anymore where effectiveness, efficiency and successful outcomes are pre-requisites for business success. Just getting better at what you currently do (doing things right) is the route of diminishing returns. The harder we try, the tighter we get, the poorer the gain each time around. Let’s contrast that with doing the right thing. Here we seek to determine what the right thing is, and in our language it centers on Successful Customer Outcomes (SCOs). And that isn’t about (just) filling forms correctly, tightening bolts or producing widgets. It is a philosophy that seeks to improve our alignment in everything we do towards the SCO. It is geared to understanding Causes rather than fixing effects, and unfortunately again so much of what is called ‘improvement’ is about fixing effects, rather than flushing out the Cause of Work (COW) and the Points of failure (POF). The approach we have distilled from global leading companies, which we call Customer Expectation Management Method (CEMMethod), has a set of principles and philosophy that makes sure everything you do improves the SCO. CEMMethod helps an organization bring their processes, systems, strategy and people into ‘outside-in’ alignment. Does CEMMethod work? Absolutely and that’s precisely what allows those leading companies to carry on creating clear water between themselves and the nearest ‘inside-out’ rivals. So how could we compare the recent emergence of CEMMethod with less effective approaches like Six Sigma and Lean? Easy. Six Sigma - Fixing problems. Doing Things Right..
For example people may not be filling in a form correctly. Six Sigma understands how often, where and what could be done to improve accuracy of the form. Lean - Doing Things Right, and sometimes doing the Right Thing. Similar to Six Sigma however goes a stage further in removing waste associated with form completion by removing unnecessary steps and sometimes as a consequence negates the need for a form entirely. In doing so occasionally, but not by design, stumbles into doing the right thing. Both Six Sigma and Lean don’t challenge directly whether the form helps to achieve an SCO. CEMMethod - Doing the Right Thing. Doing it Right, doing it even Better. Asks whether the form contributes to the achievement of the SCO. If it doesn’t we stop doing this dumb stuff. It is typical to find that a massive amount of work in a CEMM examined process becomes unnecessary and in doing so frees up scarce resource. The good news is that those ‘outside-in’ success stories can help all of us embrace the SCO and identify and achieve immediate substantive triple crown benefits for our organizations. Triple Crown - Concurrently Improving Revenues, Enhancing Service and Reducing Costs. Outside-In - understanding and living an approach that recognizes the only reason an organization exists is to deliver SCOs. In doing so achieving Triple Crown benefits which benefit the Customer, the companies employees and the shareholders. What is your SCO and how aligned is your organization to achieving it? Steve Towers, Co-founder and Chair of BP Group and founder of Towers Associates, is an expert on process and performance transformation. Steve has bases in Europe (UK) and Colorado. 22 companies from around the world walked home with Global Awards for Enterprise Architecture & BPM Excellence amidst enough fanfare at the Architecture & BPM Excellence Awards 2011 organized by iCMG, a Global Enterprise & IT Architecture Firm. John Zachman headed the program with presentations and Awards to noted firms from around the world. Lloyds Banking Group, UK for the IT Landscape Rationalization and Deutsche Bank, UK for Best Green Architecture. Tesco Hindustan Service Center walked away with the 'IT Service Management' award. Though this is the second year the awards have been instituted, we received more than 100 entries from across 21 Countries. After carefully analyzing the nominations, it's interesting to note that architecture practices are not restricted to a specific vertical or industry. This is quite evident as the nominating companies belong to over 16 plus industries. said Mr. Jha. The awards were interspersed with a spectacular dance performances from different parts of India, specially commissioned for the awards night. This event is now a premier global conference and should be on everyones radar if you are interested in Enterprise Architecture and Business Process Management. 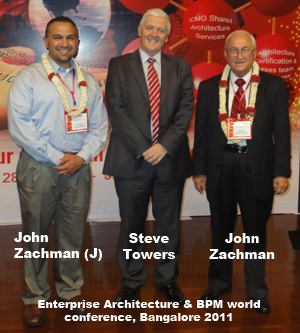 Labels: Author, BP Group, BPM, BPM News, Founder and CEO, J P Zachman, Steve Towers, Successful Customer Outcomes, Sunil Dutt Jha, Vice President of Marketing, Zachman International Inc.